Few things in the wine world is so impressive as to develop and maintain a house style. It's a bit like ''Mom's apple pie'', there is really no single secret that makes them so special, but it is the whole .... Top wines from Gustave Lorentz always express a unique style: fragrant, soft and caressing but still form with vibrant acidity and an abundance of ripe fruit. Lorentz wines never wines that smell like gas stations, which proves that the wines are picked perfectly ripe. 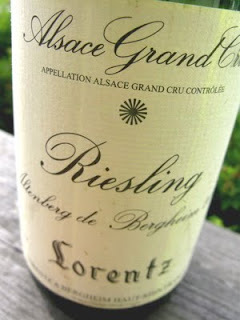 2002 Riesling Grand Cru Altenberg de Bergheim is straw coloured. The scent is seductive with a thousand kinds of flowers, acacia honey and blood orange. The flavour is full, balanced and smooth as velvet, while the acidity wraps the sweet fruit in the finest silk. A wine to share with someone you really love. Price: € 14.60 (ones upon a time), now € 22.